Wow! My first blog award! Wow! I am VERY excited and honored to be awarded. I have put a lot of time and effort into my blog. All my heart goes into my blog. I am so happy to think that someone thought my blog was worth enough to award me. I would like to take a moment to thank www.freespiriteater.com for this honor. Please take a moment and visit her blog. Her blog is wonderful. I always enjoy reading her post. I have met some wonderful friends. Thank you! 1. I don't like to swim in Texas lakes. 3. I like to laugh. 4. I want to write a cookbook. 5. I am not a materialistic person, I could live in a small house in the mountains and be just as happy. 6. Thanksgiving is one of my favorite holiday's, spending time with family and friends and good food. 7. My favorite place in the home is the kitchen. Now, I am suppose to pick 15 bloggers that I feel deserve this award. There are so many wonderful bloggers. So many bloggers deserve this award. This is going to be very hard. Please visit these wonderful blogs. Hi Christine! What an honor. Thank you so much for sharing this award with me. Like you, I don't like swimming in Texas lakes. My husband loves it though! Thank you for sharing with me...and for making me smile. I hope you have a happy Friday. The weekend is almost here, and I'm ready for it! Christine...Congrats on the award and thanks for sharing it with me...I've only swam in one TX lake....Lake Arrowhead in North TX...no I didn't like it...nice to get to know you better. I know a couple of the bloggers you listed, I'll check out the others in the morning...off to bed...Have a great weekend. Congratulations on your first blogging award, I'm sure it will be the first of many! Thank you so much for thinking of me, I am honored! Thank you so much for the award. 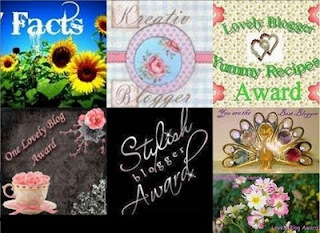 I am in the company of such amazing bloggers, and I am truly honored. I will have to wait until after the Online Bake Sale to pay it forward though. Lots to do. Thank you Christine for the award! I am in the company of truly amazing bloggers, and am honored. I'm doing the Online Bake Sale, Monday May 2nd, so I won't be able to pay it forward, until after the bake sale is over. Thank you so much, Christine. My favorite place is the kitchen, too. No matter where I live, it always seems to be the heart of the home. I appreciate your including me in this list of otherwise fantastic bloggers. Fantastic on the award. Well done and also interesting to see some new blogs I didn't know so thanks for sharing. It was very sweet of you to think of me. Aww Christine thank you so much for including my blog among those wonderful bloggers..it is really an honor! And congrats on receiving one..
Congratulations on your award, Christine and thank you for sharing it with me! Thank you so much! I'm excited and honored! You also deserve the award. I love your blog to. Good job! You deserve the award! I love your blog. Good job! Thanks for all you do! Have a great vacation. Welcome! Glad you liked your stay. Thank you so much for the award Christine. And congrats on receiving your own! It's so nice to be recognized and know you're thought of highly by fellow bloggers, isn't it? I truly appreciate it! I am truly honored. Thank you so much for the award. I am your newest follower and hope to see many more recipes in the future! Take care! Congrats! We've never won an award over at The Chocolate Cult but then we only do recipes rarely so I never expect any. I'm so happy when blogs I check out win though. Thank you so much. I love your recipes, and I'm honored that you would pass this award along to me. Thank you! congratulations on the award! well deserved and your cake look so moist and yummy! Hi it is me again..just to compliment you on that beautiful cake! Looks and sounds divine!!! Looks so sweet and wonderful!